Media and public attention have primarily focused on the large-scale effects of drug abuse--on crime, the economy, and society in general. This important book looks instead at what drug use does to teenage drug users and their families. Leading experts provide rational, thoughtful answers to the questions most commonly asked by concerned parents, counselors, and teenagers: Why do teenagers resort to taking drugs? How can I tell if my son or daughter is on drugs? What is the difference between use and abuse of marijuana? How can I help someone in need of treatment? The book begins with an overview of adolescent drug use. It introduces common drugs and their symptoms, distinguishes different types of drug users, and summarizes the types of treatment available. Interviews with adolescent abusers reveal the alarming prevalence and depth of the problem. The authors then examine the legal consequences in detail--the laws and their enforcement, the police bust, juvenile trial procedures, and sentencing. The book discusses the inevitable stress, frustration, anger, and pain parents feel when they learn their child is using drugs. Brief vignettes depict typical parental reactions--effective and ineffective--and suggest where and to whom parents can turn for help. Finally, the contributors discuss how to prevent adolescent drug use at home, in school, and in the community. 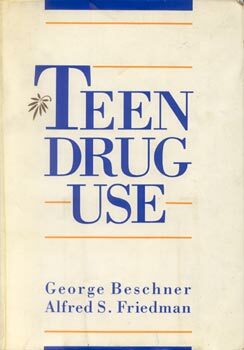 George M. Beschner is chief of the Tecnology Transfer Branch of the National Institute of Drug Abuse. Alfred S. Friedman is director of research at the Philadelphia Psychiatric Center.